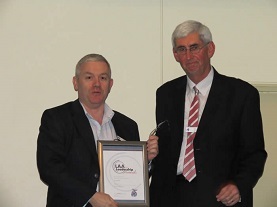 Rob O’Byrne was very proud to receive the LAA President’s Leadership Contribution Award on behalf of Logistics Bureau. This award is for significant participation, support, and contribution to the Logistics Association of Australia within the last year. This Award is presented to an individual or company nominated by the Board of Directors of the LAA. The Board of Directors assess overall contribution / participation from a number of sources including membership participation, programs and events participation and volunteer support to the LAA’s cause of advancing our vision and mission. There is no call for nominations for this award and winner/s is announced at the Annual General Meeting.